Turquoise Boy has been a local favorite for 5 years without ever releasing an album. That's about to change. There's a little inside joke among the members of Turquoise Boy that illustrates both their early success and ensuing predicament. The band's first performance was opening for a major national act, St. Vincent, at University of Alaska Anchorage. That was 2011, and while they continued to score high-profile gigs in the years since, Turquoise Boy never got around to recording an album. "We used to joke that it was going to be so long until we recorded any music that the debut album would be called 'The Greatest Hits,' " said bassist/singer Winston Monticello with a laugh. With the anticipated release of "24 Hours a Night," the debut from Turquoise Boy, the band finally recorded the music that Alaska fans have enjoyed live for years. 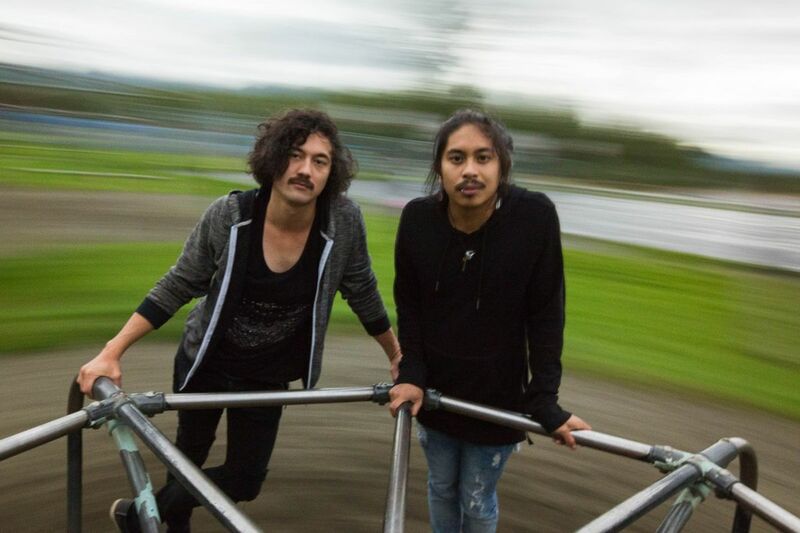 "One of the big criticisms we've gotten is that we haven't put anything out official except for YouTube bootlegs and all the demos that scored us (shows) in the first place, which is ancient stuff of mine," guitarist/singer Derek Mangrobang said. "A lot of bands try to get the recording out of the way first to secure these gigs. We were getting everything we could possibly desire with having nothing. We didn't have to worry about it." Turquoise Boy started with Mangrobang, Marc Bourdon on bass and Kelsey McGee on drums, all alums of The Smile Ease. When Bourdon submitted some of Mangrobang's songs to UAA in an attempt to land the opening gig for St. Vincent, the band was unofficially formed. Monticello got the call days later. "I play bass in the band now, but they wanted another synth and guitar so they contacted me and it was literally days after that they were like 'We have a show now,' " Monticello said. That show immediately vaulted Turquoise Boy into the upper tier of live acts in the state. "Right off the bat we were blessed," Mangrobang said. "Within nine months of the band existing we played with a handful of national acts. We got really, really lucky right off the bat. We all took it super seriously from the get-go. We didn't ever have a problem getting good gigs, which was really lucky. It set the tone for the rest of us." The early success wasn't the only reason the band bypassed the traditional progression. Since forming, the band has undergone a few lineup changes. Bourdon and McGee eventually moved out of state. In 2013, Adam Waldron joined the band on drums and Monticello shifted to bass. Monticello's move was only meant to be temporary, but the band coalesced and in short time scored another massive opening slot. This time it was opening in Anchorage and Fairbanks for Imagine Dragons, which would go on to win a Grammy in the next year. "We thought, 'Can I switch to bass while we look for somebody?' " Monticello said. "But it went so well. Two months later after we decided to make that change, we got offered the opening gig for Imagine Dragons. We decided, 'This is sounding pretty good. Let's just play it out and wrap the arrangements around the setup we have now.' "
In another circumstance, the opportunity with Imagine Dragons might have raised the band's profile. But in many ways, Turquoise Boy had already achieved that prominence in state and it left the band with a bit of an identity crisis. "Imagine Dragons was such a huge peak, in any other state, I feel like that would have broke the opening band into another level," Mangrobang said. "In Alaska, after that it was like, 'what are we going to do now?' "
Rather than seek greener musical pastures, like many other Alaska artists, the band has resisted any urge to relocate. "I really like the Anchorage community," Monticello said. "I didn't want to leave. When people play in bands up here, there's this idea you have to go somewhere else. I just didn't want to do that. I like doing it up here. This is a really cool community to be a part of. I just feel I didn't have to leave. I wanted to contribute to it." The band had aborted previous attempts at recording, and in some ways, "24 Hours a Night" represents an ultimatum. "What pushed us to finish this record was the fact that Adam left to finish his degree in Seattle and he left on Dec. 1 (2015)," Mangrobang said. "We decided this is either going to happen now or never." Instead of looking for another drummer or scrapping the band altogether, Turquoise Boy recorded with Waldron at their own studio with producer Jay Hall. "Before Adam left, we said 'Let's record the songs we normally play' " Mangrobang said. "When Jay came in, we didn't have this vision of a record. Jay actually had a big part to do with it. We cut all the songs we were going to cut and he said 'You know this is a record, right? It's supposed to be arranged as a record.' A large part of the sound was because he totally interpreted what we did and took it to a level where we were like 'yes.' "
With Hall steering the production, the album unfolds with excitement and energy, but with a turbulence suggested in the album's title. The record's first single, "Best Summer Ever," melds pop, punk and rock, a merger that's a mainstay of the band's sound. But Mangrobang said the album is less about staying within a genre as it is about delivering quality songs. "At the bottom of everything, is it a good song?" he said. "It's a delivery. If you subtract that out of the equation, it's the song. It doesn't have to be played that way." And Monticello said "24 Hours a Night" is in many ways a culmination of five years of friendships they developed with local artists, musicians and fans. "I couldn't emphasize enough, the project is not just Derek and I," he said. "There was so much support and push."